with LED torch plus 6 sanding discs. 0 - 90˚ pivoting head ensures you follow the contours of the work surface, in any direction. 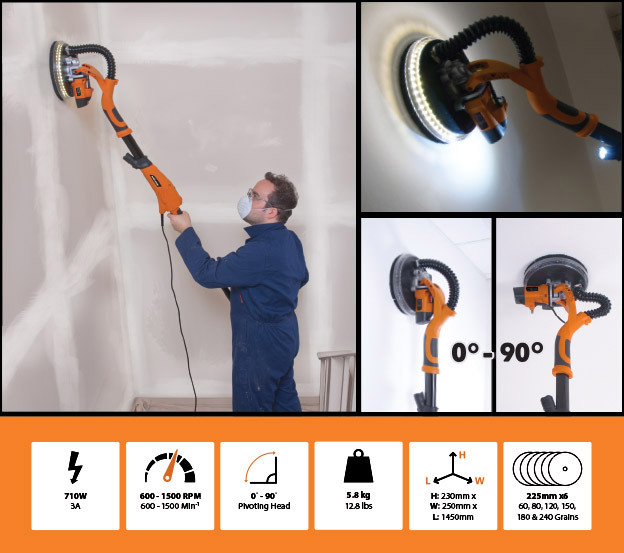 The telescopic design extends this lightweight dry wall sander to 1.97 metres in length, making it easy to sand those hard to reach areas comfortably. 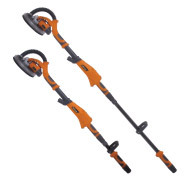 Other features include soft grips on the main handle and bail handle for effective control and perfect weight balance. The dry wall sander is equipped with LED lighting allowing you to see any shadows created by unsmooth areas, when lighting is insufficient. Accessories include six easy mountable sanding discs in a variety of grades to suit any application. Grades include: 60, 80, 120, 150, 180 and 240. A 4metre hose is also supplied which is attached to the end of the pole and can fit most vacuum ports.